Back to Tasco cause I almost forgot where I was. Far right is stand up and take notice. The 9VR has superior baffling in the draw tube. The 999VR is restrictive. The 9VR is threaded for the standard Vixen 1.25" adapter. The 999VR is some 'who knows what' fine tread and the 1.25" adapter won't fit more than one thread, maybe. 999VR on the left, 9VR on the right. Aside from the stronger stalk and 4 bolt pattern, there are other subtle differences that are better on the 9VR. That's all I took for now. Questions welcome, but don't expect me to remember the offer. Not all of the Vixen made 60mm short tubes were good. I had a Circle V marked Cometron 60 version that had wedge or decenter in the objective and could only handle 40x or so before going soft. I even tried re-cementing it and couldn't improve it much. Made a nice finder though. 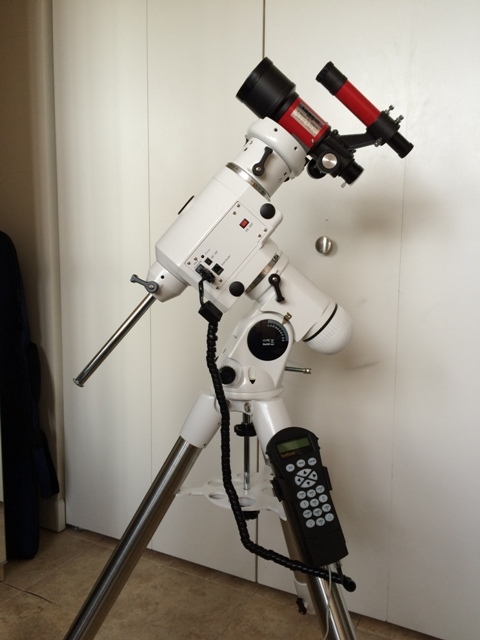 I use the tabletop pier for my TeleVue 60 nowadays. Wow, that's a beautiful ST80, Terra! You're forgiven. I parted with my 99vr a while ago. I've been looking for a replacement ever since I sold it. 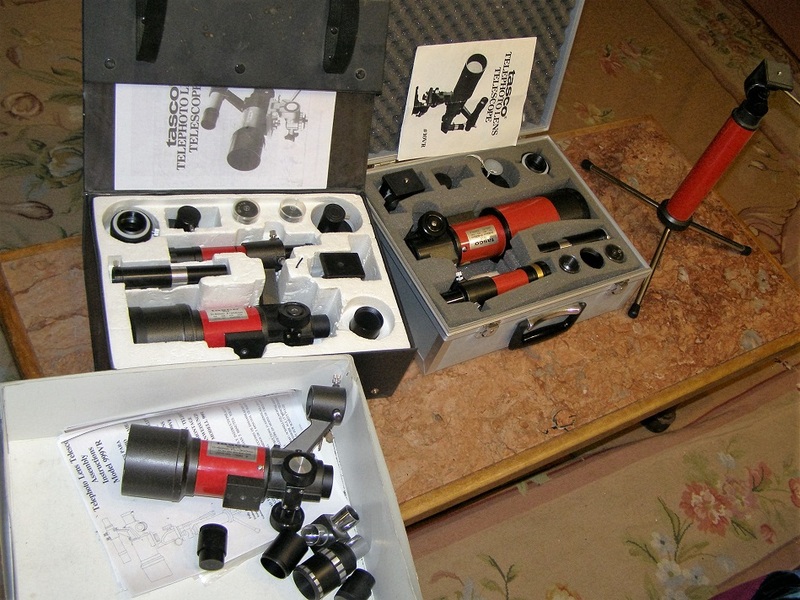 Yesterday, a Celestron version was on eBay, but I was out bid! 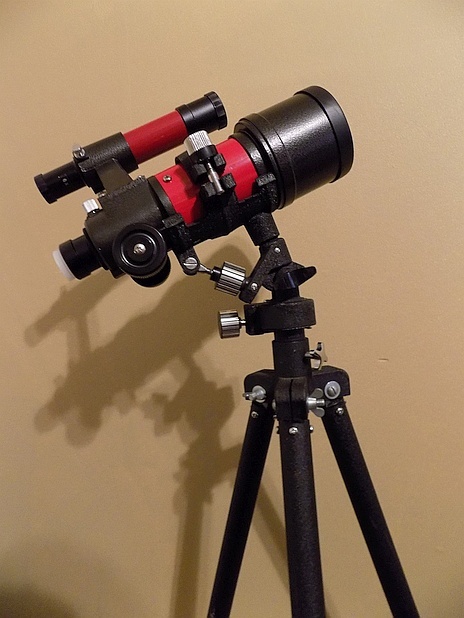 My current Table Top Refractor is an SV50 "little rascal" on the Alt-Az mount that commonly came with the Tasco 999vr. The optics on the Stellarvue scope are very good. I usually stay between 13mm and 25mm eyepieces. 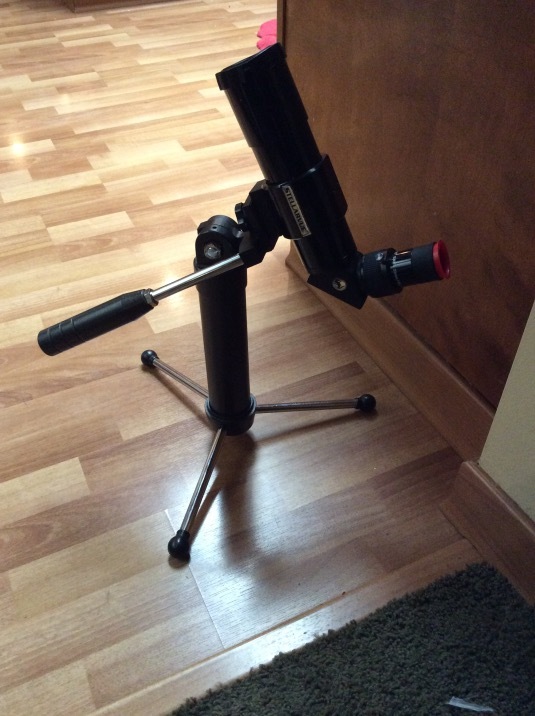 The mount is very sturdy, and very convenient to transport. I pack the entire setup into this little bag. I'm surprised this Alt-Az mount design hasn't been recycled into a current version. The bottom of the center column is threaded for 1/4-20, so the assembly can be mounted on a photo tripod. I concur Terra, Totally forgiven. Now take a permanent black magic marker and write the word "TASCO" in a prominent spot on the tube thus ensuring it will hold it's value over time. All fun aside that it probably the best looking ST80 I have ever seen. Looks like it weighs in close to my SV Nighthawk, which is so stout I could defend my house with it, (provided I could muster the strength to swing it). The SV little rascal looks made for that mount. Nice looking set-up. Apfever, I'm sold. You have made a valid case for the focuser being better on the 9vr. Still overall I'm pleased with the 999vr and I stay on the lookout for a 99vr to complete the "9's" collection. Edited by bulletdodger, 13 September 2016 - 05:59 PM. My 999VR came with a 1.25" accessory adapter, but the kit didn't have the original box, so I don't know if it was part of it. Mine was also missing the finder & bracket. I really can't tell any difference in focusing between the Tanzutsu & Vixen versions. But, I rarely used the T model above 30x. Very solidly mounted! Nice to see someone with their priorities properly aligned. I took the visual back off of my Synta made 80mm f/11 and it threaded perfectly onto my 999VR. Maybe the threads on your 999VR are boogered up. My 9VR has a new mount & tripod - the 93T arrived today. The racks are different on mine, but my 99 uses the Vixen adapter just fine. The baffles are certainly different. Nope. they are distinctly different threads. visually obvious. As much as I enjoyed using my 9VR, it's now on its way to its new owner in Vermont. I have another 60mm scope on the way (Tak FS-60Q), and decided that I couldn't justify owning that one plus three other 60mm scopes (7TE-5, 9VR, and 999VR). And the 7TE-5 is a definite keeper, which isn't going anywhere for a long, long time. So I put my 999VR up for sale on AM and found a buyer within an hour. 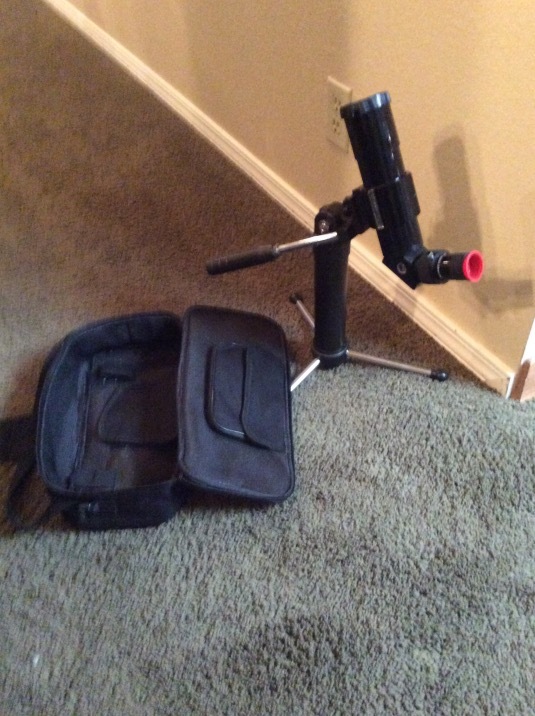 While he and I we were discussing classic scopes I mentioned that I had a 9VR with tabletop tripod as well, and he offered to buy that one too. I had been planning to keep the 9VR for a while, but the truth is that I wouldn't likely use it much once the new Tak arrived. So I sold both. And when I broke the news to my wife about the new 60mm scope that was going to arrive in a few days, I was able to tell her "honey, I sold two scopes today and am replacing them with just one scope." That would have worked out really well, except my teenage son squealed on me and said "mom, Dad's new scope is another Takahashi, and I'm pretty sure it cost more than both of the scopes that he just sold." Kids!!! What is this "Standard" 1.25" adapter you speak of? Is it available for sale somewhere? Scopestuff maybe? I use the Vixen 36mm to 32mm thread-in adapter; but the Tasco (and even generic Chinese) versions work, too. That's the one that I bought for my former 9VR. On Amazon for under 15 with shipping included. I've always bought the ones direct from Japan. So you have to wait two weeks. They're half the Cost! Thanks Chuck. I actually had one in my accessories box.. weird because I don't know what scope it came off of , but it threaded right on. 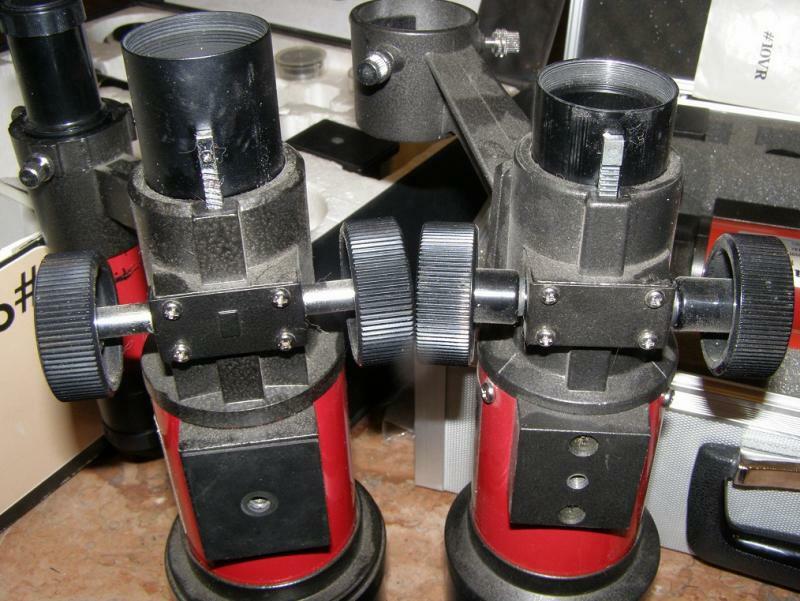 Should be fun to try out some good 1.25" eyepieces in this scope. 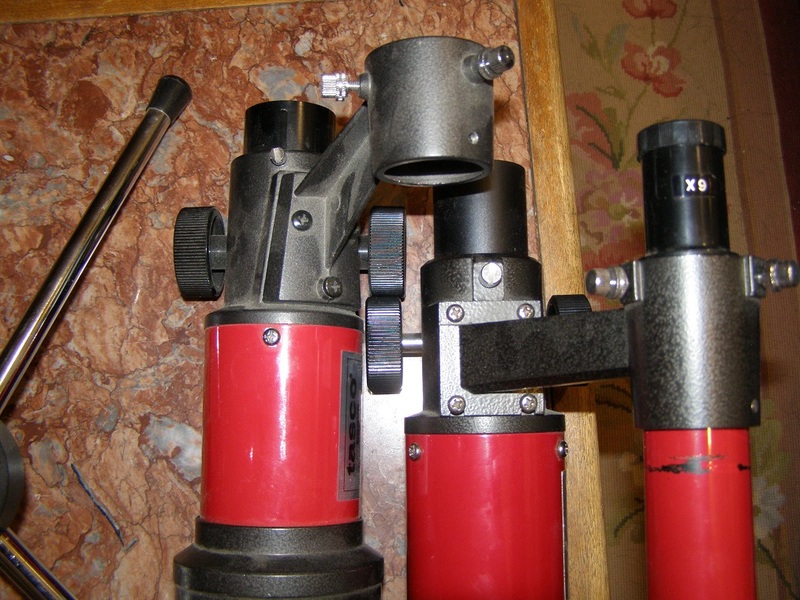 Great thread about small red telescopes! I received my Tasco 9VR and came without the tripod adapter with fine controls and without the instruction manual. I'm looking for the user manual but I can not find it ... can you help me? On the other hand, I had a scare, since I was very misaligned. I have removed the original diagonal prism ... and then I have observed without diagonal, then with another Vixen diagonal, and the collimation is correct. 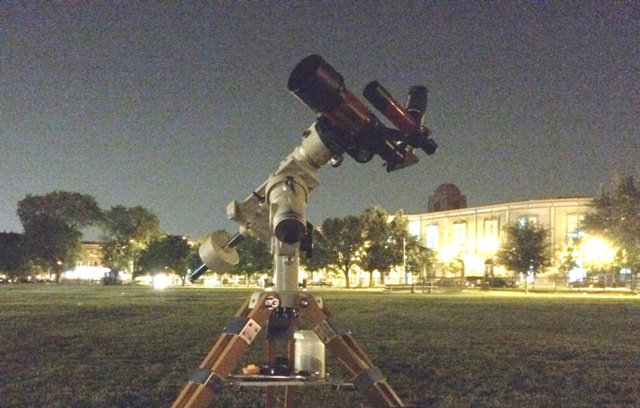 Great telescope.